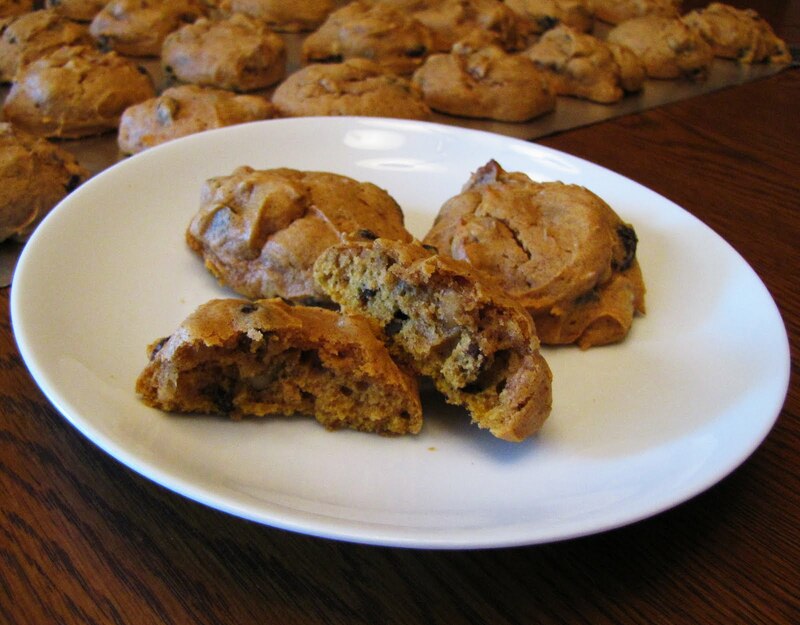 I’ve been looking everywhere for a recipe for a pumpkin cookie that my mom used to make for my dad all the time. They were a drop cookie, which is a cake like cookie that bakes in a little mound. They tasted like a pumpkin pie, but had raisins and walnuts in them. I’ve looked all over online, and hadn’t found the exact recipe. Low and behold, this afternoon I was looking through my new Thanksgiving Cookbook (I know, I’m sick) and I found a recipe that looked almost spot on. Made a few adjustments and they turned out terrific! Makes about 36 cookies. Heat oven to 375°. Beat sugar, butter, egs, and pumpkin in mixer. Stir in remaining ingredients except raisins and nuts. Stir in raisins and nuts. Drop dough by rounded spoonful about two inches apart onto an ungreased cookie sheet (about 9 cookies to a sheet) Bake 8-10 minutes. Enjoy!